The following is an abridged and narrated transcription of the conversation between Dr. David Korten and Mayor Park Won Soon, joined by Professor Cotton. Original translation was provided by Audrey Jang. 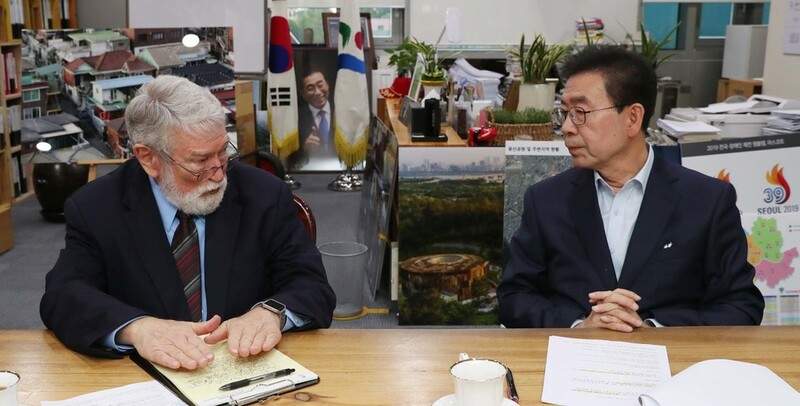 On the morning of October 10th on the 6th floor of Seoul City Hall, Mayor Park Won-soon and Dr. David Korten, former Harvard Business School professor, discussed the intersection between ecological civilization and urban transformation. One of the leading scholars elucidating and promoting ecological civilization, Dr. Korten was in Korea for the two-day ‘2018 Seoul International Conference on Transition in Seoul’ hosted by the Seoul Metropolitan Government from November 11 to 12. The event, held under the theme of ‘Civilizational Transformation and the Experiment of Cities,’ was a place for sharing Seoul’s urban innovation experience with the international community and seeking global solidarity for urban transformation. Professor Cotton, a leading scholar who advocates for ecological civilization discourse, also attended the conference, giving a presentation titled “Transition to Ecological Civilization: The Role of the City” on the first day, hosted by the Hankyoreh Economic and Social Research Institute. Q: Although humanity has continuously developed imaterial civilization, it is difficult to ignore the negative effects on the earth and the natural environment, to the point that the neologism ‘Anthropocene’ has emerged as defining the current geologic age. I would like to hear from both of you about the path that human civilization has walked thus far. David Korten continued the conversation, drawing on his experience growing up in a conservative middle-class family. He noted that it was while working as advisor to the U.S. Agency for International Development that he became an ardent critic of capitalism as he watched Western European nations’ development policies destroying the lives of indigenous peoples and the poor in developing countries. Listening to Dr. Korten, translator Audrey Jang wondered whether the ecological discourse he emphasized could be applied universally to both the southern and northern hemispheres, where the developmental stage and situation are different. Q: The city of Seoul is investing significant effort in the urban regeneration project. Professor Korten, do you have a word of advice for Seoul? At this point, Professor Cotton pointed to the map of Seoul’s pedestrian streets and praised it as “cool, excellent.” Mayor Park agreed, recounting his experience last summer staying in a rooftop house in Samdeangdong of Gangbuk. Q: Do you have any last things you want to say to each other? Mayor Park chuckled as he offered to Dr. Korten, “Why don’t you remain in Seoul for another month and observe the neighborhood.” In closing the discussion, Korten pronounced three conclusions, one by one. Korten: “First, there is a radical transformation occurring in world leadership: from the prideful individualism of the West to the Eastern thinking that understands the importance of community. Second, even the rich must realize that the status quo has no future. If the people die and the earth dies, it’s all over. We must move towards a society that distributes wealth and revives the community. Third, we do not have much time left. It is too late to make a change. We should do the most we can as fast as we can.